Academic Search Premier from EBSCOhost The world’s largest academic database, Academic Search Premier provides full text for nearly 4,650 serials, including full text for more than 3,600 peer-reviewed titles. PDF backfiles to 1975 or further are available for well over one hundred journals, and searchable cited references are provided for more than 1,000 titles. Updated daily. MasterFILE Premier from EBSCOhost Full text articles from nearly 1,800 business, health, news, and hobby magazines, including Consumer Reports, Health, Time, and many more. It also offers indexing and abstracts for over 2,700 periodicals. Full text backfiles go as far back as January of 1990, while indexing and abstracts backfiles go as far back as January of 1984. Updated daily. Newspaper Source from EBSCOhost Newspaper Source provides selected full text for 25 national (U.S.) and international newspapers. The database also contains full text television & radio news transcripts, and selected full text for more than 200 regional (U.S.) newspapers. This database is updated daily via EBSCOhost. Find these additional databases: Alt Health Watch, Computer Source, ERIC, Health Source, MAS FullTEXT Ultra, Professional Development Collection, Psychology & Behavioral Science Collection, Religion & Philosophy Collection, Sociological Collection and Vocational Search & Career Collection. American and English full text literature collections A fully searchable library of more than 350,000 works of English and American poetry, drama, and prose, plus biographies, bibliographies and key secondary sources. Hobbies & Crafts Reference Center by EBSCOhost This database offers detailed “how-to” instructions and creative ideas to meet the interests of virtually every hobby enthusiast. Full text is provided from leading hobby and craft magazines. Literary Reference Center from EBSCOhost Full text of literary journals and respected literary reference works. Contains plot summaries, literary criticism, author biographies and interviews, and the full text of thousands of poems and short stories. Research an author, novel, or poem for school or personal interest. Learn more about a literary movement for book discussions. NoveListPlus NoveList Plus is a great way to find reading recommendations, with book reviews, articles, lists and more. KFL cardholders can access NoveList from home; enter your library card when prompted for a Patron ID. With more than 60 million images, 127 searchable categories and intuitive search functionality, Price It! Antiques & Collectibles is the ultimate identification, research and pricing tool for collectors, dealers, appraisers and anyone in between. KFL cardholders can access PriceIt! from home; enter your library card when prompted for a Patron ID. Business Source Premier This is the industry’s most used business research database, providing the full text for more than 8,800 serials. Business Source Premier provides full text back to 1965 and searchable cited references back as far as 1998. Coverage includes virtually all subject areas related to business. Updated daily. Take the law into your own hands and create accurate, reliable legal documents with no hassle or stress with Gale LegalForms, complete with Law Digest module. It offers the most robust collection of accessible legal information available. KFL cardholders can access Legal Forms from home; enter your library card when prompted for a Patron ID. Lynda.com by LinkedIn Lynda.com has been the leading provider of online learning content for 20 years, with more than 12,000 courses, ranging from computer programming to project management including instruction on various computer software, programming languages, and business topics. The video courses are taught by industry experts and are designed for any skill level. ReferenceUSA ReferenceUSA helps users locate people, research companies, collect data, and quickly access a wide variety of valuable information. KFL cardholders can access ReferenceUSA from home; enter your library card when prompted for a Patron ID. Vocational & Career Collection Designed to meet a wide variety of vocational and technical research needs, this collection provides full-text coverage for trade and industry-related periodicals including Modern Machine Shop, Pediatric Nursing, Wireless Week, Drug Store News, Reeves Journal, Restaurant Business, Advertising Age and many more. Oxford Research Encyclopedias Oxford University Press works with international communities of scholars across all fields of study to develop current, comprehensive collections of in-depth, peer-reviewed summaries on an ever-growing range of topics. World Book Academic Academic World Book is a comprehensive reference tool that includes encyclopedia, multimedia, e-book, and primary source databases, fully integrated in a single search and tailored to the needs of college- and university-level students. World Book Early World of Learning The Early World of Learning is the premier online resource for preschoolers and children in the early elementary grades. Developed with experts on early childhood education, the Early World of Learning offers rich resources designed for easy integration into the classroom curriculum. World Book Online All the information of World Book in a searchable database, geared for all ages. World Book Spanish The Spanish-language version of World Book Encyclopedia. African American Heritage African American Heritage is a groundbreaking digital resource exclusively devoted to African American family history research, created in partnership with leading African American genealogists and recognized leaders in genealogical information to develop a comprehensive mix of resources, records, and tools specifically pertaining to African Americans. Ancestry Online (Only available from the library) Ancestry Library Edition provides easy access to more than 4,000 genealogy databases with a single search. Coverage focuses primarily on the United States and the United Kingdom, although other areas are covered. 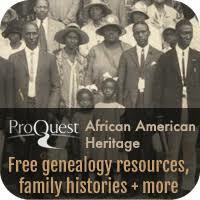 Databases include the complete U.S. Census & Index (1790-1930), vital, church, court, and immigration records. The Map Center contains more than 1,000 historical maps. Other notable collections include Daughters of the American Revolution Lineage Books; Social Security Death Index (updated monthly); WWI Draft Registration Cards; Federal Slave Narratives; and a strong Civil War collection. Databases are updated continuously as new information becomes available. Biography Reference Bank More than 72,000 biographies and obituaries and more than 20,000 photographs of the subjects. Many of the biographies are enhanced with full text, abstracts, and citations. The biographies are searchable by name, profession, title, place of origin, gender, race/ethnicity, titles of works, date of birth, date of death, keyword, and presence of images. Fold3 Fold3 provides convenient access to military records, including the stories, photos, and personal documents of the men and women who served. Heritage Quest HeritageQuest Online provides genealogical and historical sources for more than 60 countries, with coverage dating back as early as the 1700s, including birth, baptism, marriage, death, military, census, and immigration and naturalization records; cemetery indexes; Social Security Death Index, a map and photo collection, and more. Consumer Health Complete Full text journals, magazines, and reference books from EBSCOhost dealing with health, wellness, fitness, and nutrition – coverage includes a focus on the complementary, holistic and integrated approaches to health and wellness. Browse medical, health-related and drug reference books. Read articles on health and fitness. Find sources for alternative health information. MedlinePlus The National Library of Medicine’s (NLM) premier bibliographic database covering the fields of medicine, nursing, dentistry, veterinary medicine, the health care system, and the preclinical sciences. Contains bibliographic citations (e.g., authors, title, and journal reference) and author abstracts from over 3,900 biomedical journals published in the United States and 70 foreign countries during the current four years. Contains over 9 million records dating back to 1966. NetWellness Includes periodicals (indexing to over 150 titles with selective indexing and full text of health-related articles from over 2500 general interest periodicals), pamphlets (full text coverage of over 500 medical education pamphlets) and reference books (full text coverage of Mosby’s Medical Dictionary, The People’s Book of Medical Texts, Oryx Press Consumer Health Information Source Book, USPDI Drug Information in Lay Language, and Columbia University Complete Home Medical Guide. Explora Explora is EBSCO’s new interface for schools and public libraries. Designed specifically for its users, the interface supports student research and classroom instruction. Kids InfoBits Kids InfoBits’ content-rich, authoritative, easy-to-use digital resource featuring age-appropriate, reliable, curriculum-related content covering a broad range of educational topics makes it the perfect educational product for today’s young learners. Primary Search (Grades K-6) Containing full-text for more than 80 of the most popular elementary school magazines, Primary Search is designed specifically for elementary school libraries. All full-text articles are assigned a reading level indicator (Lexiles), which allows users to read along at their own pace. This database provides thousands of relevant photos, maps and flags to aid kids in learning. This database contains full text for a variety of popular middle school magazines. All full-text articles are assigned a reading level indicator (Lexiles). Full text is also available for thousands of biographies and historical essays. Middle Search Plus contains primary source documents including Essential Documents in American History, reference books such as the Funk & Wagnall’s New World Encyclopedia; New Oxford American Dictionary, 2nd Edition; Encyclopedia of Animals; and thousands of relevant photos, maps and flags. Points of View Reference Center Points of View Reference Center contains many topics, each with an overview, point and counterpoint . Providing a balance of materials from all viewpoints, it also includes over 1,300 main essays, leading political magazines from all sides of the political spectrum, newspapers, radio & TV news transcripts, primary source documents and reference books. It also offers guides for writing position papers, developing arguments and debating. Containing resources that present multiple sides of an issue, this database provides the basis from which students can realize and develop persuasive arguments and essays, better understand controversial issues and develop analytical thinking skills. Very Short Introductions Oxford’s Very Short Introductions offers concise and original introductions to a wide range of subjects. Not simply a textbook of definitions, each volume provides trenchant and provocative–yet always balanced and complete–discussions of the central issues in a given topic. World Book Kids Intended for grades K-8, World Book Kids is a fun and interactive way to introduce younger students to the world of online learning. Searching is simple and can be done by keyword or by choosing a general subject that breaks down into specific topics. The encyclopedia also provides images, diagrams, maps and activities tied to national curriculum standards. Rosetta Stone Rosetta Stone offers the proven immersion method that millions of learners around the world have trusted for over the last 20+ years. KFL cardholders can access Rosetta Stone from home; enter your library card when prompted for a Patron ID. Transparent Languages Choose from over 100 different languages, including English as a Second Language, to study with Transparent Language’s courses. Auto Repair Reference Center from EBSCOhost This database contains do-it-yourself repair and maintenance information on most major manufacturers of domestic and imported vehicles. New repair procedures, TSBs and updates are added to the product on a regular basis. All of the content has been created by ASE certified technicians. Includes coverage of more than 37,000 vehicles from 1945 to present, millions of drawings and step-by-step photographs, and approximately 110,000 technical service bulletins & recalls issued by the original equipment vehicle manufacturer. Chilton Library Chilton Library provides access to repair, maintenance and service information on the most popular cars, trucks, vans and SUVs on the road today, as well as, many new vehicles. This continuously updated resource provides step-by-step repair procedures, troubleshooting guides, diagnostic trouble codes, photos, illustrations, diagrams, and multimedia (videos and animations) to simplify even the most complicated tasks. Facts on File Science Online Science Online offers a comprehensive, curriculum-oriented overview of a broad range of scientific disciplines in a variety of useful formats. The accessible content is organized by subject area and type of resource, as well as by national and state science education standards. Also includes more than 1,100 science experiments and activities, indexed by grade range, subject category, and time required. Home Improvement Reference Center Provides full text access to reference books, magazines, images, and videos to help with maintenance, remodeling, electrical work, decorating, plumbing, outdoor improvements and more. Science Reference Center Topics covered in Science Reference Center include biology, chemistry, earth and space science, environmental science, health and medicine, history of science, life science, physics, science and society, science as inquiry, scientists, technology and wildlife. By providing a wide range of topics, Science Reference Center satisfies the demand for standards-based content by providing teachers and librarians with articles correlated to state and national curriculum standards. Science Reference Center contains full text for hundreds of science encyclopedias, reference books, periodicals and other sources. The Ohio Web Library databases are funded in part through an Institute of Museum and Library Services LSTA grant awarded by the State Library of Ohio.